This is the DeeperBlue.com Beginners Guide to Scuba Diving. We’ve put this guide together to help budding Scuba Divers understand what is required to get started. Part 19 of this series takes a look at Learn Proper Dive Boat Procedures. While you do your Open Water Diver training, you are under the watchful eye of your instructor and maybe a divemaster or two. That training may have been all shore dives or maybe from a boat. If you had boat dives and shared the boat with certified divers, you may have a good glimpse of how to dive from a boat. You may of also had your first introduction to “that diver”. Every dive boat seems to have one, it is the diver that ticks off the other divers for his actions or being inconsiderate. When someone says “that diver”, everyone know who they are talking about. Often it is a combination of not caring and not knowing. Most divers will give some lead way to a new diver, but no sense on risking a bad experience. 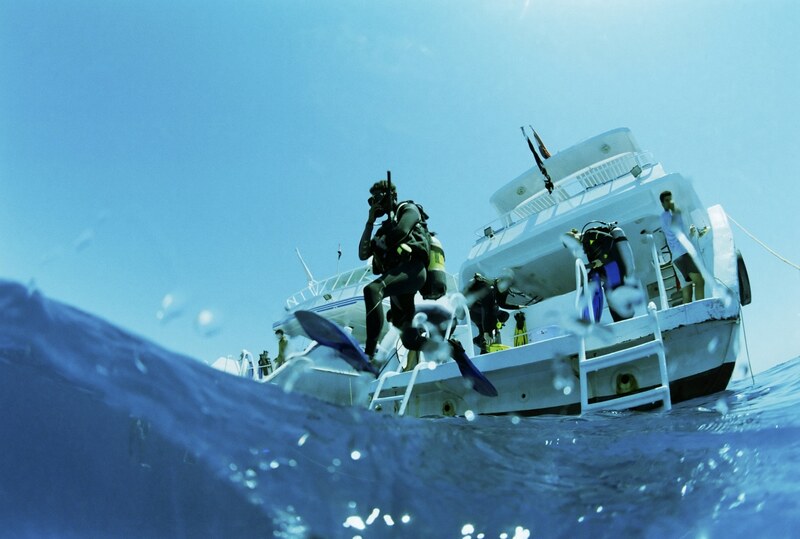 Here are some tips so that you can feel comfortable on your early boat dives. After some time these will all become second nature to you, just like the diving skills you learned. Organize your gear – Dive boats range in different sizes and the layout will be different for each. One common trait is that space is limited. If you have your own dive gear, bring it to the boat in a soft bag that can fold up. Hard cases should not be used or if you do have one, arrange to leave it on shore if possible. If you are getting rental equipment boat side, then storage of the bag is not a problem. If the dive boat has lockers on the dock or dive office use it for your clothes. Bring a small dry bag that is waterproof and large enough to hold the non diving items you might bring with you, such as phone, wallet, tips for the crew and your clothes if not able to leave ashore. You should bring a towel to dry off after the dive. Many dive boats will have a fresh water shower. A small additional chamois hand towel is great to wipe your hands and face. Check-in time is late – When you arrange your dive, the staff will give you a check in time and likely a departure time. Consider the check-in time as being late. Arrive earlier, ask about the procedures and relax as you get ready. A diver that arrives late can cause a delay that effects everyone from leaving on time. Permission to Come Aboard Captain – Do not assume that you can board the dive boat as soon as you arrive. The crew may have tasks to do both on the boat and loading tanks. It goes much faster when no one is in the way. So ask before you come on board, and no you do not need to salute the flag like in the Navy. Equipment stations – If you are diving from a rigid-inflatable boat (RIB) or a rigid-hulled inflatable boat, (RHIB), you will likely set up your gear before boarding. These boats are generally small with no room to walk around. Larger boats however will have ample space for you to move around and set up your gear. They will often have an equipment station for each diver with two tanks and place to store your gear. If there was no boat briefing, when you board introduce yourself and ask if you can set up your gear. Most dive boats encourage setting up before leaving the dock. Never place your weight belt anywhere except the deck until you are putting it on. A set of weights sliding off a bench and on to someone’s foot leaves a bad first impression. Keep all of your gear within the limits of your space and out of the way. Camera tables and buckets – Underwater photography and video cameras can be very expensive. Sure, You can get a nice sports camera that will take still and video images for a few hundred dollars, providing you with images to share with your friends and social media. Professional work requires professional equipment and comes at professional prices. A professional camera may cost thousands of dollars, with another couple for the underwater lighting and the same for the housing. Most dive boats will provide a bucket of fresh water reserved for photography equipment. It is the only thing that bucket and water should be used for. Most photographers will stow their photography gear in the bucket as soon as they set up. After the dive, a camera is rinsed in fresh water and returned to the bucket to soak. This helps to keep salt deposits from forming on the cameras. Under no circumstances use it for anything else. Some dive boats will also have a camera table. Again his is reserved so that photographers can work on their cameras between dives. These are dry spaces and should not get wet. Respect this custom. Many photographers love their equipment as much as they do their children, and some spouses will say they love the equipment more. Briefings are important – When you board an airplane one of the things they do before departure is a safety briefing. On the dive boat you will have the same thing. The dive boat briefing will include information about safety gear on board, location of oxygen and life jackets and procedures if the boat must be abandoned. It will also point out other features of the boat, including dry areas and those restricted to crew only. Marine heads, the toilets, are often fragile compared the one you have at home so procedures of using them might also be included. You will also have a dive brief for each dive. The brief will often include the methods to be used to enter the water and how to get back on board. Some boats might have you pass up all your gear, others just your fins and cameras. Even if you dived the location before, pay attention things change. If you have any questions, wait until the dive leader ask if there are any questions. Most boats have a check out/ check in procedure to ensure no diver is left behind. Make sure you understand and follow it. Lets dive – The boat and dive briefs will have given you the information need to start your dive. There is no need to rush, the ocean not going to leave. Follow the procedures given and walk carefully. The deck of a dive boat can be slippery. After the dive – Secure your gear as soon as you can and try to stay out of the way of everyone. Make sure your mask goes into the mask case and weights are properly secured. Account for all your gear and make sure you have only your gear. Grab some water and hydrate. If there are snacks, take only your share. Respect the dry zone – Some dive boats will have an area as a dry zone often an air conditioned enclosed space. For everyone’s comfort dry yourself before entering and do not bring any equipment. Some boats suggest removing wet suits before entering. Tips – dive and boat crews do not earn much so make sure you leave a nice tip, if they help make your dive memorable as each dive should be. If you follow these guidelines where they apply, you will not stand out as an inexperienced diver or worst one of those “that diver”. Like anywhere else in the world, good manners, a smile and being considerate of others while on-board will make the trip a whole lot nicer for everyone. Continue reading more from the DeeperBlue.com Beginners Guide to Scuba Diving.